Abrasive Jet Machining (AJM) is Non-Traditional Manufacturing Process. AJM is mainly used to machine hard raw material, produce complex shape. In this process chips are not formed like Conventional machining processes e.g. turning, Drilling, Broaching. 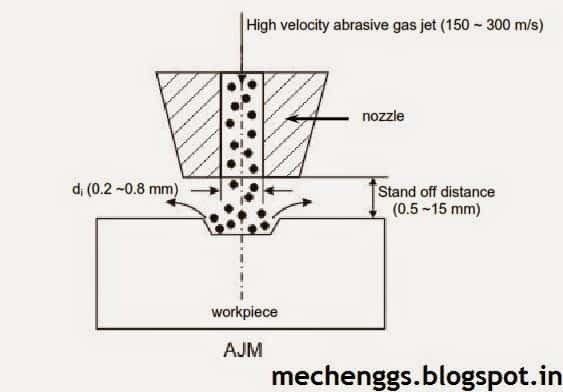 In abrasive jet machining, a focused stream of abrasive particles, carried by high pressure air or gas is made to impinge on the work surface through a nozzle and the work material is made to impinge on the work surface through a nozzle and work material is removed by erosion by high velocity abrasive particles. In Abrasive Jet Machining (AJM), abrasive particles are made to impinge on the work material at a high velocity. The jet of abrasive particles is carried by carrier gas or air. The high velocity stream of abrasive is generated by converting the pressure energy of the carrier gas or air to its kinetic energy and hence high velocity jet. The nozzle directs the abrasive jet in a controlled manner onto the work material, so that the distance between the nozzle and the work piece and the impingement angle can be set desirably. The high velocity abrasive particles remove the material by micro-cutting action as well as brittle fracture of the work material. Fig. 1 schematically shows the material removal process. AJM is different from standard shot or sand blasting, as in AJM, finer abrasive grits are used and the parameters can be controlled more effectively providing better control over product quality. In AJM, generally, the abrasive particles of around 50 μm grit size would impinge on the work material at velocity of 200 m/s from a nozzle of I.D. of 0.5 mm with a stand off distance of around 2 mm. The kinetic energy of the abrasive particles would be sufficient to provide material removal due to brittle fracture of the work piece or even micro cutting by the abrasives. In AJM, air is compressed in an air compressor and compressed air at a pressure of around 5 bar is used as the carrier gas as shown in Fig. 2 . also fig shows the other major parts of the AJM system. Gases like CO2, N2 can also be used as carrier gas which may directly be issued from a gas cylinder. Generally oxygen is not used as a carrier gas. The carrier gas is first passed through a pressure regulator to obtain the desired working pressure. The gas is then passed through an air dryer to remove any residual water vapour. To remove any oil vapour or particulate contaminant the same is passed through a series of filters. Then the carrier gas enters a closed chamber known as the mixing chamber. The abrasive particles enter the chamber from a hopper through a metallic sieve. The sieve is constantly vibrated by an electromagnetic shaker. The mass flow rate of abrasive (15 gm/min) entering the chamber depends on the amplitude of vibration of the sieve and its frequency. The abrasive particles are then carried by the carrier gas to the machining chamber via an electromagnetic on-off valve. The machining enclosure is essential to contain the abrasive and machined particles in a safe and eco-friendly manner. The machining is carried out as high velocity (200 m/s) abrasive particles are issued from the nozzle onto a work piece traversing under the jet. Process Parameters and Machining Characteristics. 2. Cleaning of metallic smears on ceramics, oxides on metals, resistive coating etc. 5. Used for cutting thin fragile components like germanium, silicon etc. 6. Register treaming can be done very easily and micro module fabrication for electrical contact , semiconductor processing can also be done effectively. 7. Used for drilling , cutting , deburring etching and polishing of hard and brittle materials. 8. Most suitable for machining brittle and heat sensitive materials like glass, quartz, sapphire , mica , ceramics germanium , silicon and gallium. 9. It is also good method for deburring small hole like in hypodermic needles and for small milled slots in hard metallic components. 1. High surface finish can be obtained depending upon the grain sizes. 5.Capital cost is low and it is easy to operate and maintain AJM. 6.Thin sections of hard brittle materials like germanium, mica, silicon, glass and ceramics can be machined. 7.It has the capability of cutting holes of intricate shape in hard materials. 2 Abrasives may get embedded in the work surface, especially while machining soft material like elastomers or soft plastics. 3. The accuracy of cutting is hampered by tapering of hole due to unavoidable flaring of abrasive jet. 5. A dust collection system is a basic requirement to prevent atmospheric pollution and health hazards. 7. Abrasive powders cannot be reused as the sharp edges are worn and smaller particles can clog the nozzle. 8. Short stand off distances when used for cutting , damages the nozzle. 1) Free Download Abrasive Jet Machining Full Seminar Report. 2) Abrasive Jet Machining PPT Seminar Presentation.